Before forming effectivus Chris Steele worked for Parallax Software where he developed Matador. Parallax Software was purchased by Avid Technology in 1995. 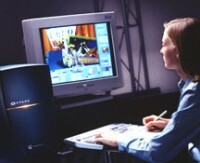 Matador was an innovative paint and 2D animation software package for the television and film industries. It was the first to offer an automation system, first to offer paint animation, and the first to use a RAM based 64bit framestore. It competed against hardware based systems which were 100 times more expensive. It sold over 2000 individual copies and several site licenses. Between 1989 and 1997 Chris was the original inventor, software architect, engineer and product manager. He worked with a highly skilled team which grew from 1 to 50 during the lifecycle of the product. Kim Libreri, ESC Entertainment, in letter supporting Technical Achievement Oscar. This entry was posted in past glories and tagged Matador, product, projects. Bookmark the permalink.